Felix Masiye, MSc, PhD, is the Dean of the School of Humanities and Social Sciences at the University of Zambia and an Affiliate Assistant Professor at the Institute for Health Metrics and Evaluation (IHME) at the University of Washington. He is the country principal investigator for the multicountry Gavi Full Country Evaluations (FCE) work in Zambia, led by IHME. The FCE aims to assess the contribution of Gavi support to immunization program performance in Zambia. 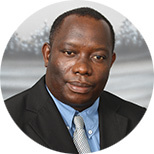 Previously, Dr. Masiye was a co-investigator on the Malaria Control Policy Assessment project, a collaborative project between IHME and the University of Zambia. The study evaluated the impact of malaria control and other health interventions on childhood mortality in Zambia. He also collaborated on the IHME project Access, Bottlenecks, Costs, and Equity (ABCE) in Zambia. In his role as affiliate faculty, Dr. Masiye supervises students’ Master of Public Health theses, serves as a supervisor for students conducting their practicums in Zambia, participates in courses by giving lectures in person when in Seattle or remotely, and serves as a resource for students working on data from Zambia. Dr. Masiye earned his BA in Economics at the University of Zambia, and his MS in Economics and PhD in Economics from the University of Cape Town. He was a postdoctoral fellow at the Harvard University Initiative for Global Health from 2006 to 2008. Achoki T, Kinfu Y, Masiye F, Frederix GWJ, Hovels A, Leufkens HG. Health system productivity change in Zambia: A focus on the child health services. Journal of Public Health Policy. 2016 Dec 8;38(88). doi: 10.1057/s41271-016-0046-8.